We have all pretty much figured out that brushing our teeth is a good thing ..well at least I hope so! While it is a good thing to do it would be a total waste of time if we just brushed them once a month. 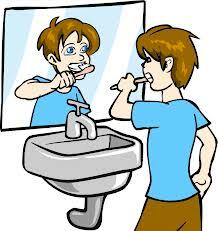 To be effective we get into a simple routine of brushing in the morning and before we head to bed at night. If we didn’t do it we just wouldn’t feel right. The same applies with your social media efforts ..
Having a presence on the different social media platforms is just a waste of time if your don’t find a proper routine for your efforts. To be effective you just have to post regularly – At a minimum I’m talking a few posts a day on Facebook, even more on Twitter, a post a day on your personal and business LinkedIn page and if you really want to be a pro at least a new blog post a week! This entry was posted on November 20, 2013 at 7:31 pm and is filed under Social Media. You can follow any responses to this entry through the RSS 2.0 feed. You can leave a response, or trackback from your own site. Hate writing just for the sake of it as it’s such a time waster. Hopefully when I contribute, it makes sense. Would love to blog weekly, but tempus fugit. Thanks for your articles – always gives me something to think about.